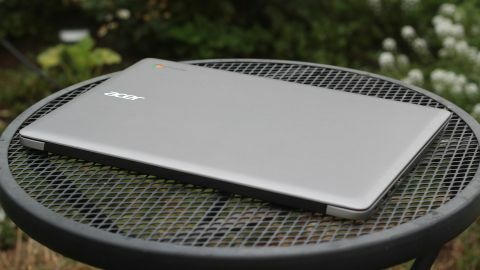 Acer's Chromebook 14 looks sharp and works well – so long as you don't try to watch HD video. Say what you will about Chromebooks, but they don't have a reputation for being particularly high-end machines. Sure, you'll find premium Chromebooks, like Google's Chromebook Pixel. But, generally speaking, they're seen as budget machines, both in price and in terms of fit-and-finish. With the $299 (about £206, AU$401) Acer Chromebook 14, the venerable PC maker hopes to bring the polish of a high-end notebook to the entry level. And, in terms of build quality, the Chromebook 14 delivers. But in terms of performance? Things aren't so clear. I'm not going to lie – when I first pulled the Chromebook 14 out of its box, the first thing I thought of was the MacBook Air. Tapered design? Check. All-metal case? Check That distinct Apple-style hinge? Check. If the HP Chromebook 14 I previously reviewed was fun and funky, the Acer Chromebook 14 is svelte and professional. And it's solidly constructed in a way that belies its relatively low price. In terms of construction, the Acer Chromebook 14 is as solid as they come. The all-metal enclosure is rigid, with minimal flexing and almost no creaking. The case does attract fingerprints and smudges, though the brushed metal surface on the lid picks up fewer handling marks to some degree. At .67 inches (17 mm) thick, the Acer Chromebook 14 is reasonably slim, and about inline with other 14-inch Chromebooks out there. Its 3.42-pound (1.55 kg) weight is similar to like-sized notebooks, and it's comfortable to pick up with one hand. Flip open the lid, and the 14-inch, 1,920 x 1,080 IPS display takes center stage. It is bright, crisp, and evenly lit – about what you expect from a notebook screen these days. Its matte finish reduces reflections, but can make the screen a little more difficult to read in sunlight. Color and contrast are solid overall, though some colors, like shades of pink, appear slightly dulled. While the display's high contrast can make images pop, it also means that darker areas of photos and videos get lost. And the downside to all these pixels is that text appears smaller than I'd like. The hinge opens a full 180 degrees and allows you to adjust the screen freely and easily, but it's a little too loose for my liking – it doesn't take much jarring to send the screen backwards when you pick the notebook up. The Acer Chromebook 14 comes with a full-sized keyboard and a spacious touchpad. The keyboard does a decent job, but its tactile feedback is a little softer than I'd like –although keys make an affirming loud click-clack sound as you type, you don't feel the satisfying click as you press the key. This is definitely usable, but it isn't my favorite keyboard. The trackpad is smooth and responsive, with good clicking action, though any sort of oil on your fingers may impair tracking. Two stereo speakers live on the bottom of the notebook. They're plenty loud, but these being laptop speakers, they're tinny and merely serviceable. For anything beyond casual listening, you'll want either headphones or external speakers.